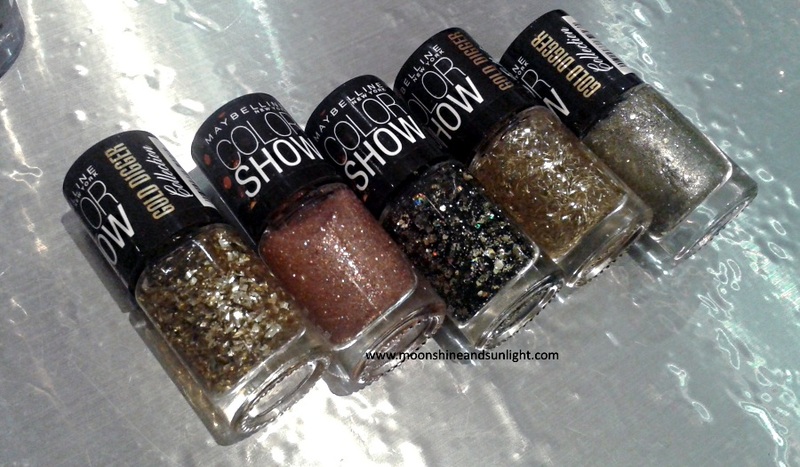 Maybelline colorshow gold digger collection ,Gilded rose, Bling Thing, Dreams of gold, gold gluttony, gold me baby and Oh-My-Gold! New launches are so exciting, especially when it is in the nails segment! And even more when it’s in the nail art segment! Yesterday I broke my ban of buying nail polishes after I saw the new Gold Digger Collection from Maybelline Colorshow! Oh yes! 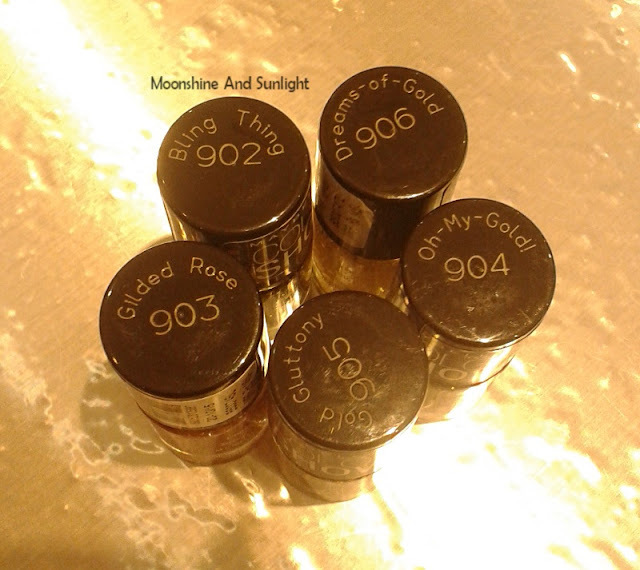 This collection features all golden based nail polishes! 3 glitter polishes and 3 top coats! Gilded rose – this is a rose gold glitter polish, a lot like the glitter mania polishes. But this is basically sans the sequin glitters. Gold me baby – again a silver-ish pale gold glitter polish but instead of gold mini sequin glitters this has gold feathers a lot like in Dreams of gold. Oh-My-Gold! – the base is same as that of Gold me baby, but instead of feathers this has sequin glitters along with gold leafs ! Bling Thing – The most gorgeous topper I have seen in a while! This contains various size of gold HOLOGRAPHIC sequin glitters along with micro black matte glitters. Dreams of gold – a topper filled with bright yellow gold feather glitters. This topper is also in a clear base. It looks a 90% like the Stay quirky Hyperventilated . Gold gluttony – Lastly, the other star of the collection. A topper that comes in clear base filled with bright yellow gold leaf glitter! There are 6 shades but I could only find 5 shades at the store, I couldn’t find Gold me baby! These are priced at 145 INR for 6ml . Any guesses which one I got for myself? I bought only one for myself although I had picked three and then The Guy reminded me of my BAN. (UGHHH!!) I Will go back to buy the other two ! Till then let me see if YOU can guess what I got!!! Also let me know in the comments which one would you buy for yourself!? Lastly Kudos to Maybelline for coming up with this collection, It is really good! Bring on some more of these gorgeous collection Guys! I am happy to see such collections in the Indian Market !